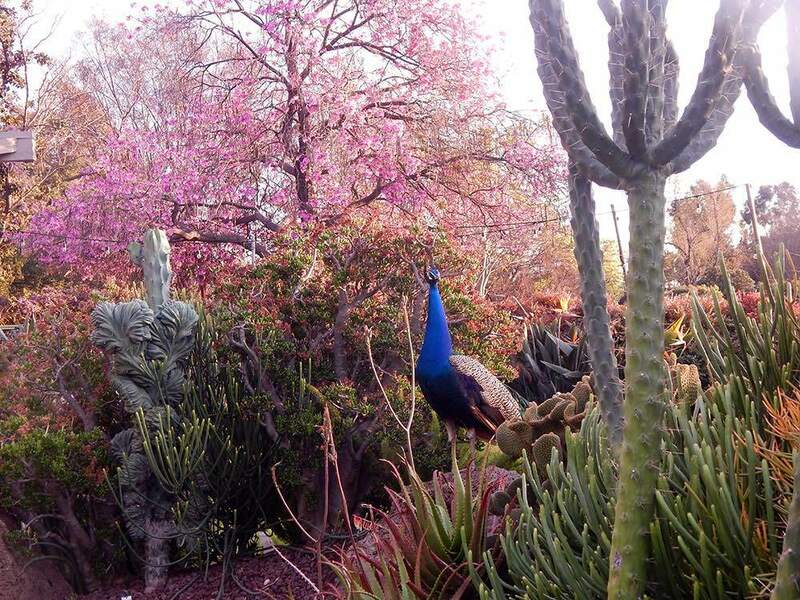 The peacock is the iconic symbol of this 127-acre garden. They serve as unofficial greeters whenever one enters. Lucky Baldwin, the owner before it became a county property, imported three pairs from China around 1910. 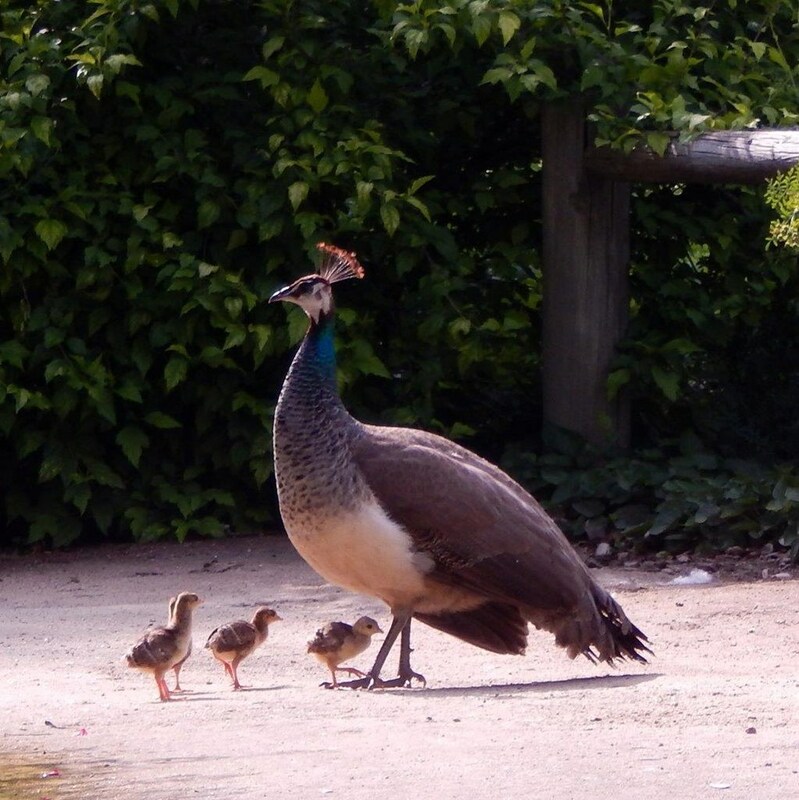 Today the population is around 250, with pea hens, babies in various stages of development, and the iconic beautiful peacock. 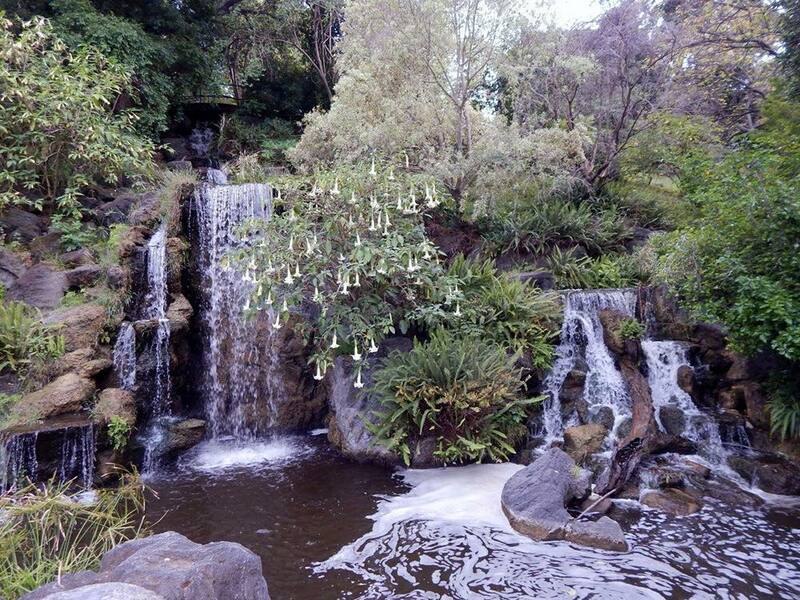 There are numerous peaceful pathways for families to explore and a tram for those who don’t wish to walk this extensive garden. As a local Arcadia resident, I visit regularly, choosing different walks depending on what is in bloom. Every month has a different plant collection in bloom. In June the daylilies are blooming, July and August the plumeria collection and the artfully-designed country rose garden that features David Austin hybrid roses. 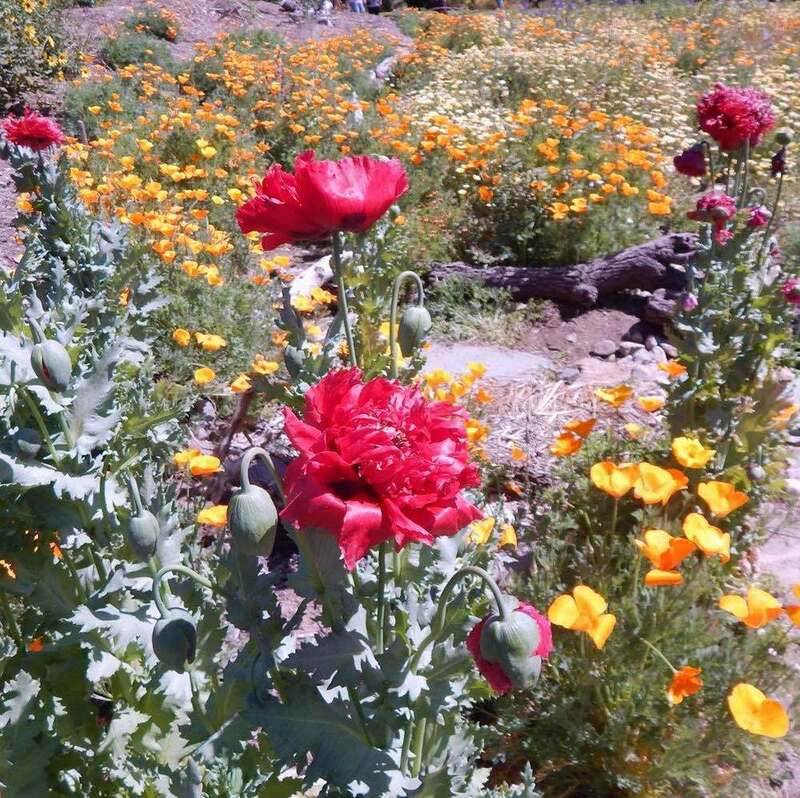 The native California wildflower garden has flowers spring and summer. During the holiday season a visit to the famous Queen Anne Cottage decorated for the holidays helps us get in the holiday spirit. It has been featured in several television series and movies. The jungle garden was the set for the Tarzan movies. There are several ponds that attract birds. Children enjoy feeding the ducks and geese and birders look for migrating warblers, tanagers, and orioles during migration. During the winter I look for wood ducks, my favorite duck. One of the most popular places to take photos is the peaceful Meyberg Waterfall. It is treat when a bride and her groom are being photographed. This is always a special treat for my wife, Lynn. We enjoyed seeing couples beginning a life together. The Santa Anita Train Depot and other historic landmarks feature Native American and Rancho period structures are also fun to explore. There are several small bubbling fountains in hidden areas of the garden and two very large dramatic sets of fountains one can’t miss. 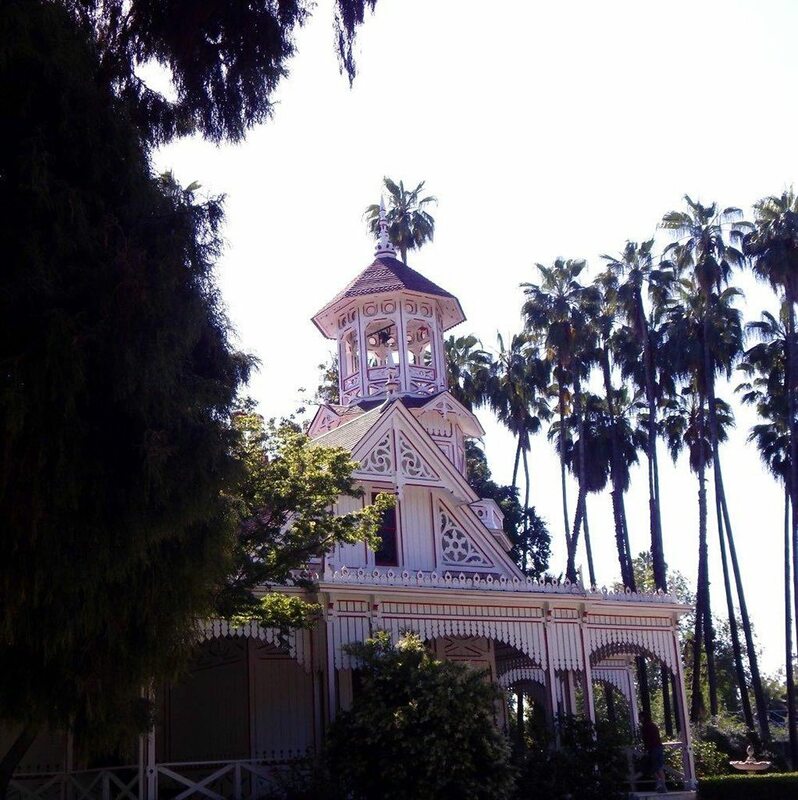 The L.A. County Arboretum & Botanic Garden offers concerts, nature, and gardening classes. 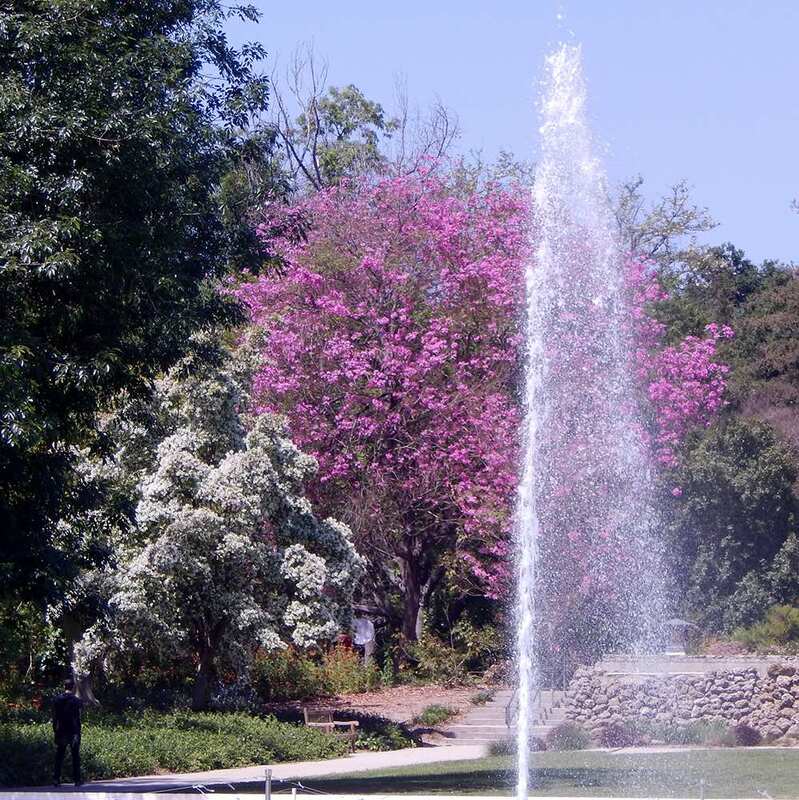 Local plant societies hold annual shows. This includes camellias, daylilies, epiphyllum, cactus & succulents, roses, geraniums, orchids, bonsai, and ikebana flower arrangements. The horticulture library has a friendly and helpful staff with local botanical artists' works hanging on the wall, which is why I visit it regularly. The Southern California Camellia Society donates camellia publications to help augment the collection. There is a luncheon restaurant aptly named the “Peacock Cafe” and a gift shop that carries some unique items and plants for sale. In conclusion, there is much for the young and the old to enjoy anytime of the year.